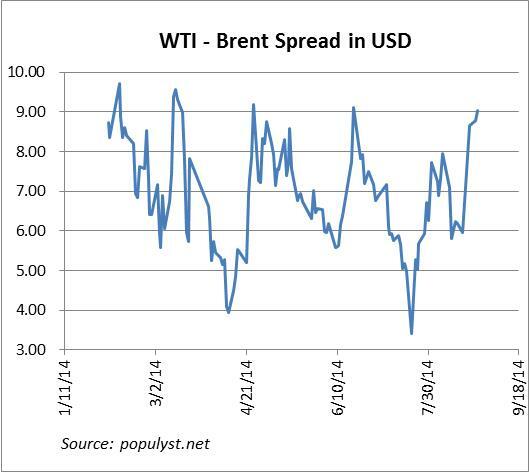 This is the fourth time in the last six months that the WTI – Brent spread has exceeded $9 per barrel. In the previous three instances, the spread then quickly narrowed to $4, $5.50 and $3. The spread opened up a few years ago with the large increase in oil production in the United States. Because the US does not allow the export of crude oil, a chronic glut in certain grades has resulted in a discount of the US price (WTI) to the global price (Brent). The instability of Middle Eastern oil supply (notably from Libya and Iraq) and the current spat with Russia over Ukraine have created new pressures on the US to allow oil exports. Until then, the large spread creates a competitive advantage for the US economy, and lower costs for manufacturers, utilities, refiners and transport industries.